SPRING TO POWER with the RTV Sidekick! 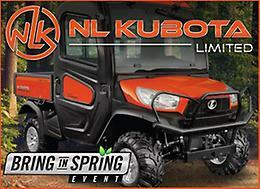 Incredible deals and financing options with our Bring in Spring event. 0% for 72 Months Financing, 6 Year Powertrain Warranty. Click here for more details! Atlantic Recreations Great Big Tire Sale!! 25 ft pleasure boat fiberglass over wood with a 3 cylinder pirkins diesel motor and hydiiclic stearing in good condition. 1998 yahama enticer 400 with reverce and in good running condition. 4x8 factory trailer in good shape and it tilts. 3cylinder long stroke pirkins diesel with transmission and shaft and prop. Looking for Unwanted or broken quads,trikes,dirtbikes or motorcycles email or text with what you have. Thinking about a New 2020 Yamaha Snowmobile, than look no further than Atlantic Recreation Ltd. With the Spring Power Surge promotion you get an opportunity to take advantage of great offers such as: 1) Free Snowmobile Cover 2) 36 month Yamaha Protection Plus 3) Great financing options 4) Entry into Yamaha SPS Sweepstakes Don't forget Atlantic recreation Ltd accepts all makes and models on trade, so drop by today and place your $500 deposit on your 2020 Yamaha Snowmobile. Offer expires April 13/2019. Contact our sales department today for more details. The #1 selling ATV cargo box is now on sale at Atlantic Recreation! Take advantage of the BIGGEST discount of the year on the Kimpex Outback cargo box! Retail $319.95 + tax Sale $249.95 + tax + redeem $30 in store rebate! Check out this beautiful 2014 Yamaha Stratoliner Deluxe 1900cc, this one owner motorcycle performs and looks like no other in the Yamaha line up! Equipped with factory colour matched faring , saddlebags and lowers. Must be seen to be appreciated. Sale priced at only $12999 plus tax and transfer. Or finance for only $119.95 / 72 mth term. Contact our sales department today for more details. CAMSO TRACK SYSTEM CLEAROUT EVENT!! !